In Scuba in Aruba, young Kenny embarks on an underwater journey to reclaim a stolen family relic. As he searches for the scattered pieces of the treasure, he'll battle cranky crabs and hungry sharks, all while gathering coins and jumping on giant jellyfish to reach new areas. 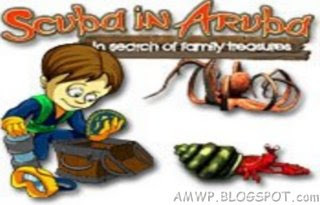 While guiding Kenny safely past sinking barrels and explosive mines, you'll marvel at the brilliant cartoon artwork that brings the oceanic world of Scuba in Aruba to life. From sunken ships to colorful coral, no detail has been left out. Don't stare for long, though, or you won't have enough oxygen to make it back to Kenny's mini-sub! Featuring simple controls and lighthearted action, Kenny's Adventure is a game the whole family can dive into!